The temperature hit 90 degrees (again) Sunday afternoon in Tampa, Florida. Even in the shade, sweat was pouring off of me in not so awesome ways. When I made back to my place, I headed directly to my fridge to find something that was refreshing and hopefully, very cold. 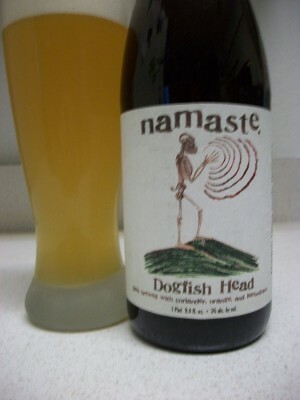 Dogfish Head describes Namaste as a Belgian-style White, made with dried organic orange slices, fresh cut lemongrass and a bit of coriander. It sounded like the perfect beer to quench my thirst. I describe it as having a golden, hazy color with a thick white foam. It had a light, delicate aroma. I smelled lemon grass and little bit of spiciness around the edges. The taste mixed sweetness with citrus. I tasted flavors of oranges and the spiciness of coriander. It wasn’t over the top, just gentle flavors telling your tongue that it’s there. I picked up a 750ml bottle for just $7.99. If you’re looking for another big, extreme beer from Dogfish Head…this isn’t the beer for you. However, if you’re looking for a refreshing beer this summer, that’s delicately crafted and won’t hit you over the head with flavor, this is the beer for you. It earned an excellent 4.5 score on the Passion For The Pint scale.